Brooklyn — The 8th Annual sale featured old-timers such as our hosts wjcohen & Alison (and daughters Lila & Ruby); about-ready-to-pop Kristen, her beau Kevin, and Kristen’s daughter Bella; and yours truly & Sari. And it was Phoebe’s first sale (though she seemed a bit subdued by the heat & humidity). We also were joined by Tim & Susan and their daughter Lily; and by a few boutique items from red_letter_days, though sadly not by her actual presence. Rob & Joy (and their new son Chance) are spending the summer in St. Louis, so they couldn’t join us; and Mark & Betsy are now officially retired from stooping, though Mark came by in his capacity as Stooper Emeritus to make sure things were running along smoothly. The crowds were solid if not spectacular, with a steady stream of customers. I did well with my mix of old audio tapes (! ), CDs, DVDs, comics & graphic novels, books, computer cables, and Sari’s clothes, pulling in a whopping $146, my best haul ever! Challenge item: Ralph Nader/Winona LaDuke presidential campaign poster. After the whole 2000 Florida debacle — and now with the Bush presidency FINALLY winding down — I thought my poster would have some value — even just so someone could take it home and burn it — but no such luck. Ironically, however, I ended up buying wjcohen‘s challenge item, a modular plastic picnic set; and he helped me out by sneaking the Nader poster into Kristen & Kevin’s leftover stuff before they schlepped it back home (hee-hee!). As always, what makes the sale so fun to look forward to every year is the chance to hang out for the day with good friends and their growing families, as well as pals (and in-laws!) who come by the sale just to say hi. I love passing stuff on to folks who want or need it (including the inevtiable cross-trading that goes on betwixt us sellers), and the odd encounters one has at these things. Like the Eastern European guy who came by looking for “broken gold jewelry. I give you good price.” Sorry, pal. Or the nice guy who comes by every year to pick through my comics and asks about A.D. or whatever current project I’m working on. We had Hanco Vietnamese sandwiches for lunch (with bubble tea, natch! ), and the day pretty much felt like heaven. At the end of the afternoon, we even felt like saints, as we dropped our leftover stuff at Goodwill, as well as donating a big box of infant clothes & toys to a Thai woman who plans to bring them to a Bangkok orphanage. Just dare me to sell this giveaway glasses case! Phoebe gets a good view of the proceedings. 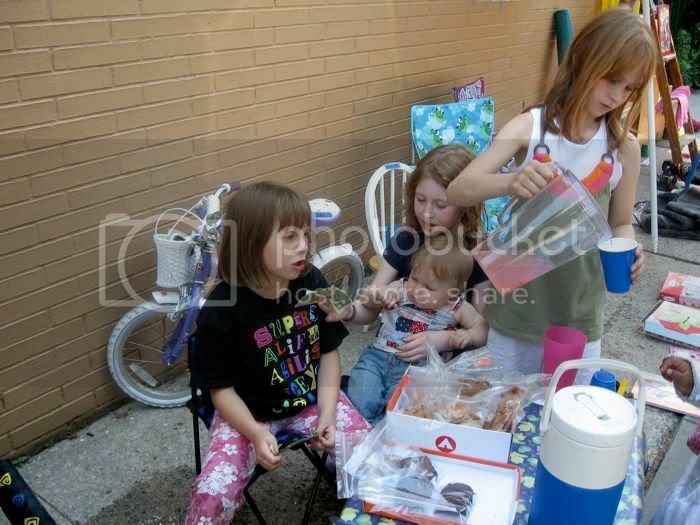 Phoebe helping out at the lemonade stand, joined by Lila, Lily, and Bella. 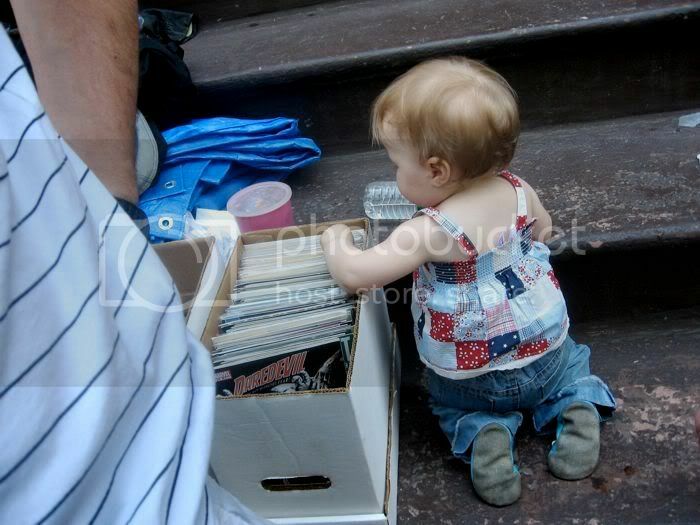 Phoebe picking through the comics, looking for items from her “want-list”. 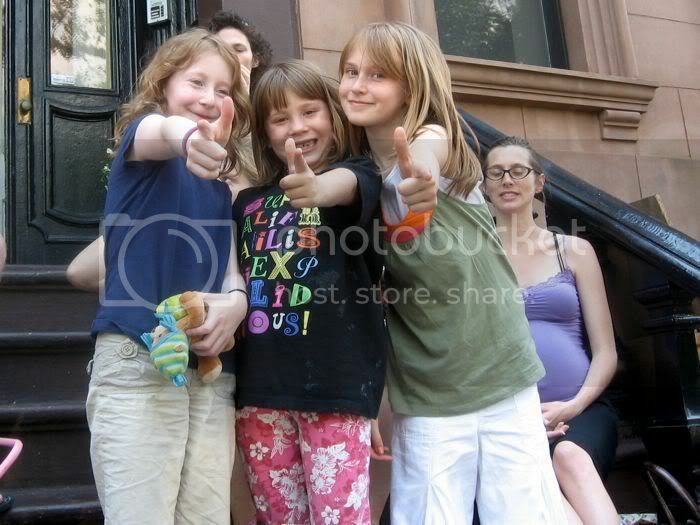 Lily, Lila, and Bella, posing for the cover of their girl-band album, as Sari and Kristen look on. 4-eyez and wjcohen, posing for the cover of their boy-band album (with wjcohen wearing my old leather jacket, having just acquired it at the sale). 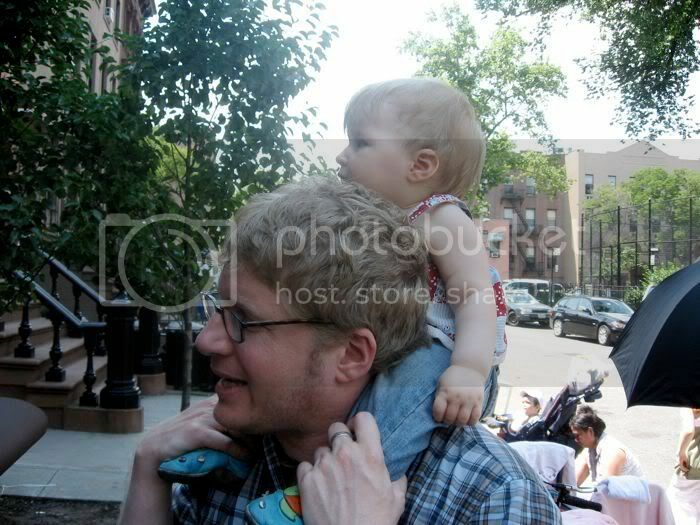 great photos – gosh how big phoebe is! congrats on breaking your sale record. This was on my list of things to do Saturday along with Leland’s party. 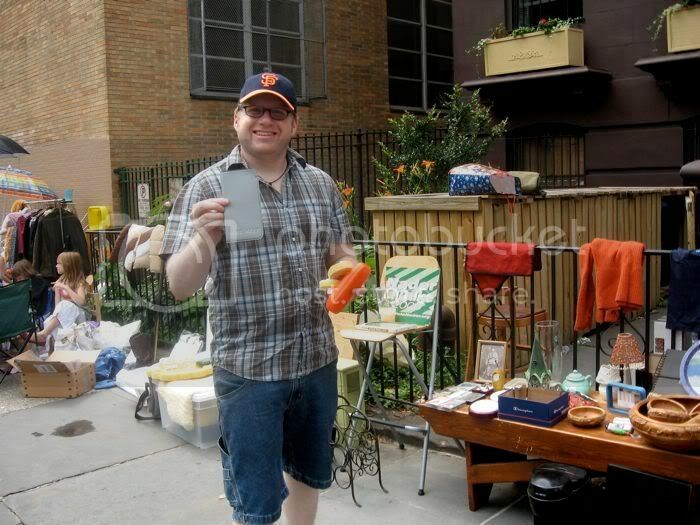 ← Brooklynites, buy more of my stuff!